Melbourne Convention and Exhibition Centre has been recognised as an Employer of Choice in The Australian Business Awards 2017. 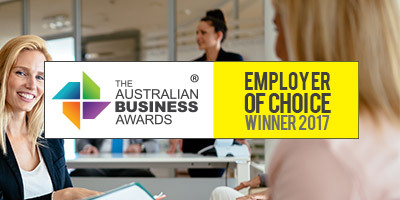 “We are absolutely thrilled to be named an Employer of Choice by the Australian Business Awards. This recognition is testament to the hard-working people at MCEC who every day, strive to ignite moments of inspiration for our guests. “We set ourselves the challenge of being awarded as an Employer of Choice three years ago. We have been on a fast learning curve, but the journey has been well planned, resourced and executed. What a team! As we expand our business in 2018, we remain committed more than ever to ensure that our culture and vales remain strong. We want to ensure that every MCEC team member understands what our business is trying to achieve, how they fit into our strategies and how their hard work and dedication forms the most critical part of the MCEC story.